Today, I did not have a project of the day. Instead I decided to practice being a responsible adult and I worked on a lot of boring projects. The project I wanted to do today was go to the craft store and get supplies to make some adorable newborn headbands/accessories for Wiggle’s newborn pictures. She’ll be here any day now, and according to my friend Shallyse at Shadeleaf Studios the best time to take newborn photos is in the first 10 days. 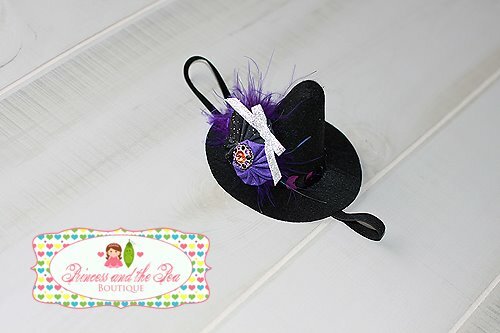 I figured I was sort of crafty, so I might be able to make something similar to the awesome (but expensive) accessories on Etsy. I’m a little nervous to go out by myself however as the baby could show up at any time. I really don’t want to be across town when labor starts and have to fight my way back through the endless construction traffic. Unfortunately both people I would normally take to the craft store were unavailable, and Dylan does not go to the craft store. Period. I couldn’t even get him to go with me to pick out fabric for something I was making for him. I figured I could settle for going to Wal-mart where I could get some cheap ribbon to play around with, and buy more yarn for crochet projects. I planned to look for some adjustable shelving units as well, but Dylan didn’t want to go anywhere. He wanted to stay home to enjoy his ‘last lazy Saturday ever’. I told him there would be other lazy Saturdays, they just might require a babysitter but he remained unconvinced. So instead of doing anything fun, I did things that responsible adults do. I finally folded and hung up the laundry I washed and dried two weeks ago. I went through my wallet and checked the balances of all of the random gift cards. I checked the budget for the rest of the month and moved money from checking to savings so it wouldn’t get spent accidentally. About a minute after I laid down, right when I was thinking about maybe sleeping for a bit, Dylan woke up from his ‘last lazy Saturday’ nap and decided that he probably needed to go to the store because eventually we were going to want to eat dinner. Unfortunately, he did not choose to go to a store that sells crafty things. We went to Sams Club. Sams Club on a Saturday afternoon is not a good idea. It’s an especially bad idea to go to Sams Club intending to get something from the pharmacy right before the pharmacy closes. Apparently everyone else in the city decided that 5:20 was a great time to go pick up their medicine from the Sams Club too. We waited for at least 20-30 minutes to get generic allergy medicine with decongestant, but unfortunately we were out of allergy medicine and Dy really needed more allergy medicine so we had to wait. Afterward we wandered around the store for a while trying to figure out what was going to be for dinner. The upside of this endless pharmacy line is that it gave me time to remember that I had decided I wanted to buy egg rolls the next time I was at Sams Club. (Yay egg rolls!) They’re so delicious, but the egg rolls were determined to be unsuitable as dinner. Dylan had apparently secretly decided that Guinness stew was going to be for dinner, but he hadn’t realized it yet, so we were wandering. We spent more than I had really wanted to spend, but we got him two new pairs of pants and he needed more pants. I expect the laundry to get pushed farther down the priority list after the baby gets here. It wasn’t exactly the entertaining shopping trip I had wanted for my day, but I was a productive responsible adult and I got to leave the house. 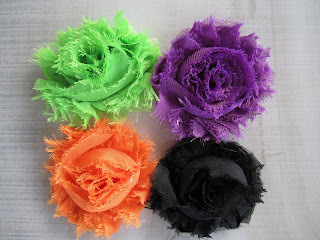 This Orange fabric flower on a headband with a clip. 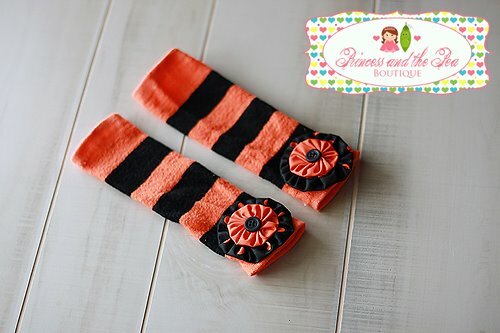 Adorable orange/black striped leg warmers. Princess and the Pea Boutique also has a bunch more cute stuff at her Etsy store, and I probably would have gotten more from the auction but they ended a bit later than they were supposed to, and so I was outbid a few times. I guess that’s what I get for leaving the house before the auctions were officially ended. I’m thinking I’ll pair the little witch hat with a black tutu, and the orange flower headband/clip with the leg warmers. Maybe the black tutu will go with the orange outfit too. Hopefully her dark faery costume to be completed soon, but I will need to make a headband to go with the tutu in case the wings don’t work for photos. So Wiggle will have the three outfits to be photographed in, and then the baby net cocoon if it gets finished. (I’m planning to take it apart and start over. I decided I didn’t like how it was shaped.) 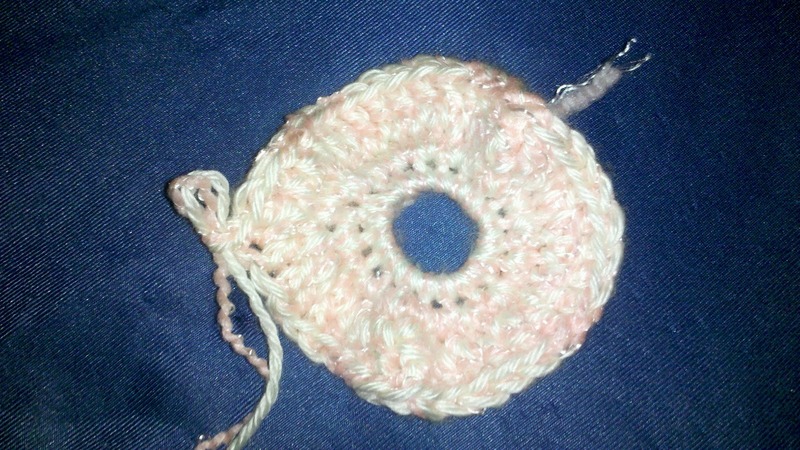 I’m also working on a very basic off white blanket for her that needs to be finished. I’ll post a picture of the blanket later. Color alternating baby beanie hat. before I realized that if I wanted the hat to fit her for newborn photos, I should probably wait until she’s here and finish it then. I don’t want to make it too big or too small. So I’ve shelved that project for now. The pattern however, can be found here. There is also a YouTube video available for this pattern. In the meantime, I thought about working on the dark faery costume for Wiggle’s first Halloween, but that’s something I don’t want to be in the middle of when labor starts. Instead, I was wasting time on Facebook where I came across this adorable photograph that was taken by my friend the awesome and talented Shallyse at Shadeleaf Studios. (Photo to be added later once permission is obtained.) I loved this baby net cocoon, and since the person who made it didn’t have any available in her etsy store (though she has a lot of cute things here), I thought I’d try to figure out how to make one on my own. Round 1: CH 1, 20 SC in your magic circle or chain. First attempt to make a baby net cocoon without a pattern. Ultimately I decided that this one wasn’t working out and I had started it way too big, so I pulled it apart and started over. Round 1: CH 1, 10 SC in your magic circle or chain. Join. Round 2: CH 1, 2 SC in each ST around (20 SC total) Join. Round 3: CH 3, DC in each ST around. (20 DC total) Join. Round 4: CH 3, 2 DC in each ST around. (40 DC total). Join. Second attempt to make a baby net cocoon without a pattern. So I tore it apart and tried again. Round 1: CH 1, 6 SC in your magic circle or chain. Round 2: CH 3, DC in each ST around. (6 DC total) Join. Round 3: CH 3, 2 DC in each ST around (12 DC total) Join. 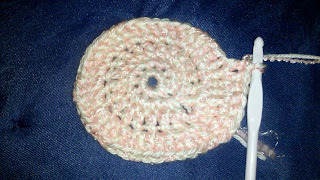 Round 4: CH 3, *1 DC in each of the next 2 ST's, 2 DC in the next St, repeat from *, you will be increase every 3 stitches. (27 DC total) Join. Round 5: CH 3, DC in each ST. (27 DC total) Join. Round 6: CH 4, TC in each ST. (27 TC total) Join. At this point I decided this looked more like a baby hat than a cocoon. And I honestly wasn’t sure if it was big enough at the bottom to continue trying to make a cocoon, or if it was big enough to become a hat either. 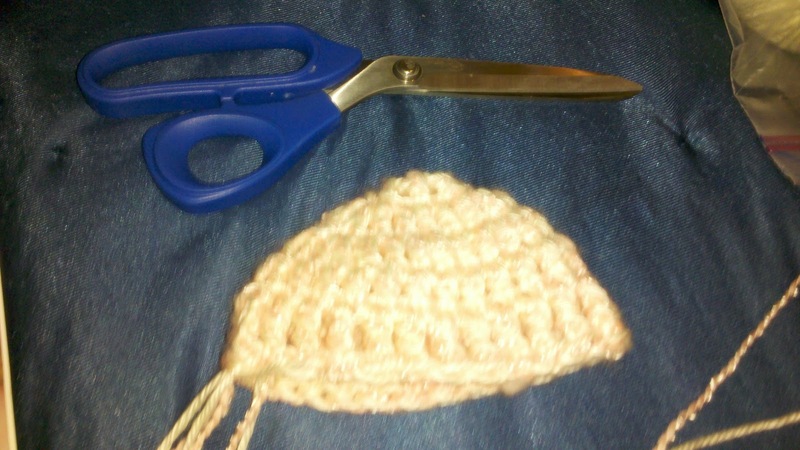 Pictured next to my scissors to show scale. 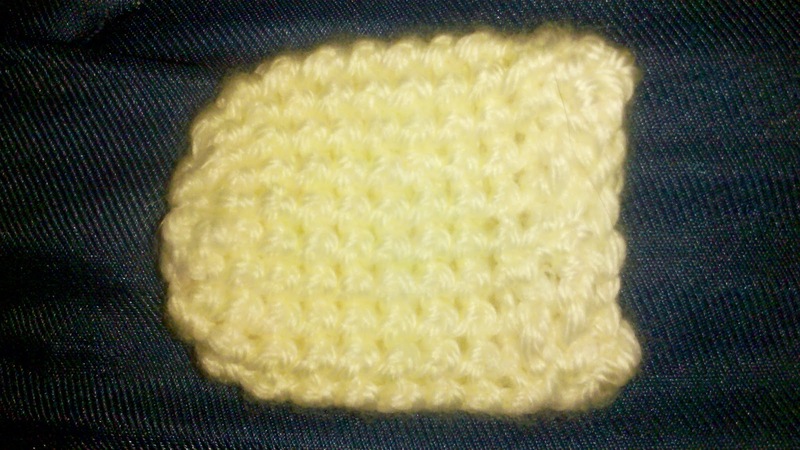 Photographed close up to show stitch detailing. So while I debate making it a real hat, or taking it apart, I thought I'd post this to show you what I've been up to today. Let me know what you think. 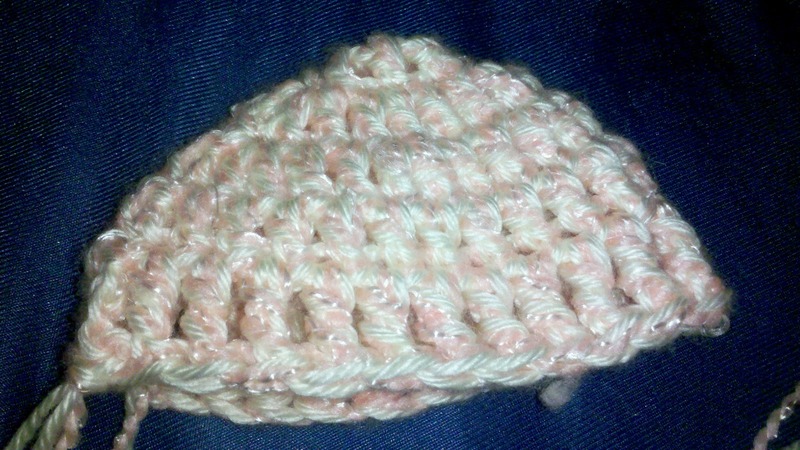 All of these have been worked using a size K crochet hook using two strands of yarn: Bernat Baby Coordinates in sherbet and Caron Simply Soft in off white. I have a habit of starting new projects at random. Many of these projects are things that never actually get finished. 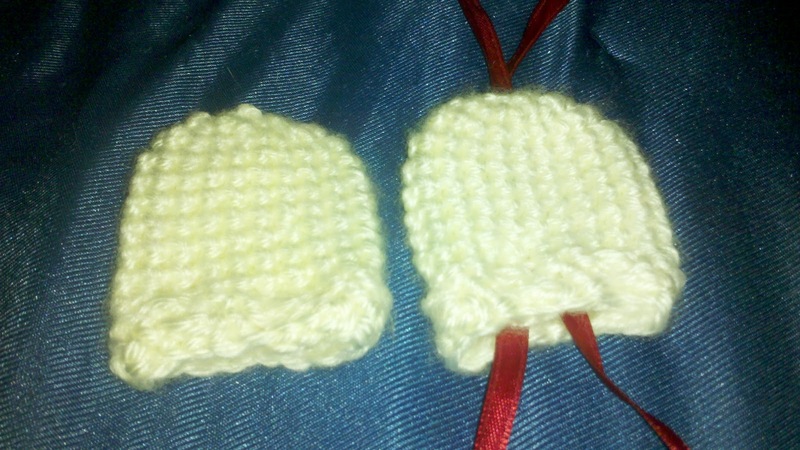 Yesterday's random project of the day was baby mittens. 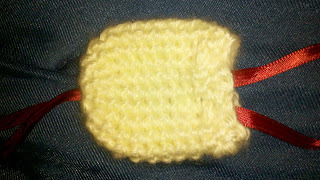 I only finished one of the mittens yesterday, but I managed to make another one today. No, I'm not entirely sure why I was working on baby mittens with all the other half-finished projects lying around, but at least I finished the baby mittens. Honestly I think it went well until I got to the part where you were supposed to make the ribbing, and then it all went to hell. I also intend to try and be fancy and make a mitten with 2 colors instead of just this cream, so we'll see how well that works out. 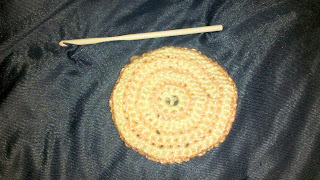 It looks like it would be cool in theory, but once again there's that ribbing that I'm not entirely sure about. I'm also not entirely sure how well these mittens are going to stay on, so I was thinking of trying another stitch along the bottom instead of the ribbing and adding some elastic to keep them on. I thought about ribbon, but I'm not sure if I entirely like that idea. The tutorial I used for these baby mittens can be found here, and were made using Caron Simply Soft yarn in off white with a G crochet hook.